Join us for EpICMavs as we host a panel of UTA alum-led startups. The discussion will cover licensing technology from UTA, getting FDA approval and more! Come learn how these UTA alums brought their startup ideas to life. This is the premier event for Women Business Owners/Entrepreneurs in Tarrant County. LEARN new strategies to grow your business. Get fresh ideas and perspectives from some of the DFW area’s most accomplished business women. Their inspiring stories, business insights and practical tips will motivate you and fuel business growth. CONNECT with other entrepreneurs and influencers. This premier gathering of business women offers an exclusive opportunity to network and share ideas with women you can relate to; women who’ve been where you are; women who just might want to do business with you. DON’T forget to bring your business cards. DISCOVER new solutions to your business challenges. Visit with exhibitors specializing in products and services that can help your business grow. Explore new solutions to your business challenges and discover innovative ways to step ahead of the competition. To learn more about NEXT visit their website. For startups in the Metroplex, navigating the seed and venture capital process can be a daunting task. You hear and read so much about investment terms and documents originating in Silicon Valley. But are local investors hip to Silicon Valley deal terms and documents such as convertibles notes and SAFEs? Ryan Roberts, venture lawyer at Roberts Foster LLPand author of the recently-released Amazon best-selling book “Acceleration: What All Entrepreneurs Must Know About Startup Law”, will share his insights for navigating and deciphering deal terms when raising capital in Texas and beyond. Ryan will guide you through seed and venture capital transactions and his recommendations on how to approach and structure venture transactions in Texas as a high-growth startup. Join us for this highly informative TechNest and bring your questions! We have a special day planned for the EpICMavscommunity. The Cowtown Angels are hosting a lunch & learn from 11:30 am to 1 pm at the Startup Loungeto discuss the ins and outs of angel investing and what all entrepreneurs should know going into raising capital. That afternoon, we'll have a fireside chat at 4:30 pm - 6 pm with two of our Angels discussing the role of investors and what makes a deal look good. Come enjoy a day with the Cowtown Angels! To join the lunch & learn, please RSVP here. You have a great business idea. Now what? How much funding do you really need to make your business dream come true? What is the best financing option for your situation? Friends, family... and fools? Traditional bank loan? Private Investor? Angel investors? Crowdfunding? How about free money? Come learn different pathways of raising capital for your business from Cathy Trinh, EMBA, a certified business advisor of Tarrant Small Business Development Center (TSBDC) and winner of the America SBDC Million Dollar Club three years in a row. Cathy has served hundreds of entrepreneurs and assisted them with access to millions of dollars of capital during her career with the Tarrant SBDC. She will share the most common mistakes entrepreneurs make, the potential landmines to watch out for and the do's and don'ts of how to increase your chance of getting the funding you need. Join us for EpICMavs as TechFW Marketing Director Sandy El-Rayes shares insights and strategies on the ever-changing landscape of social media marketing. Come learn how to maximize your engagement and reach by understanding the nuances that each platform requires. Everyone is welcome to join. See you THIS Thursday at the Startup Lounge! Before you rush out and hire an ad agency or marketing intern, you have some thinking and planning to do. Analyzing your product’s benefits, competition, audience, and potential obstacles will help you design the right communications program without wasting a lot of time, effort and resources. Join us for TechNest as Julie Wilson, CEO of Reasons Group, Inc walks us through this interactive session that will help you focus on the end goal: sales. Julie is a career entrepreneur, business strategist and communications executive with extensive corporate experience. She will set the stage for your marketing strategy and get you ready for Part 2 of our Marketing 101 series the following week where Digital Marketing Expert Logan Speightswill help you executive on your strategy. Don't Miss Out On This Two Part Marketing Series! Join bionorthTX tomorrow morning for coffee, light breakfast and networking hosted in our lobby presented by VWR. Despite the hype and misconceptions, blockchain is revolutionizing business and changing the way industries work. By bringing together allies across departments and disciplines, industries and organizations, and countries and cultures, blockchain is unlocking value. Whether it is improving existing process flows or creating new business models, blockchain is increasing transparency, trust and efficiency. Join us as Paige Krieger, business developer at IBM, shares her insight on the fundamentals of blockchain for business, including what it is, how it works, common use cases, and key considerations for building and/or joining a network. Too often as entrepreneurs, we get stuck doing the work and forget to keep filling our pipeline with new clients and projects. Whether you are a graphic designer, a consultant, or selling a new app, you have to be meeting with people constantly and keeping your sales pipeline full. Dr. Stevie Dawn serves as CEO of Orange Compass, a corporate training company dedicated to providing staff and leadership training to organizations. With over 20 years of teaching and training experience, Dr. Stevie Dawndelivers training sessions with humor and high-energy that leaves all participants inspired. Join us for TechNest as she will be sharing her entrepreneurial journey and the sales lessons she learned along the way that have led to her success. Everyone needs sales help and Dr. Stevie Dawn is sure to deliver. It's that time again! Startup Weekend is happening March 1st-3rd at UNTHSC focusing on health & wellness ideas... but it is open to ALL entrepreneurs and the entrepreneur-curious. Join us THIS Thursday at the Startup Lounge at UTA as Amy Schultz, owner of Unplain Jain Studio, goes over the strategies for building your brand. What's in a brand and how do you build one that resonants with your audience? Come find out those answers and more at EpICMavs THIS Thursday! Bring a friend and see you then! Join us for TechNest as Hayden Blackburn, Executive Director at TechFW, goes over the business model canvas(BMC). Learn how to break your business model down into easily understood segments. Understanding your BMC helps you identify gaps in your business model but more importantly helps you see how you can scale your business. Using the canvas can lead to insights about the customers you serve, what value propositions are offered through what channels, and how your company makes money. No matter what stage you are at, understanding a business model canvas and how it can be applied to your business is crucial. Everyone wants to scale their company! But not everyone knows how. Come learn the ins and out and be ready to take some notes! Whether you're an entrepreneur or a supporter, this workshop will be valuable to all! Bring your questions and a friend and come learn how to scale your business! 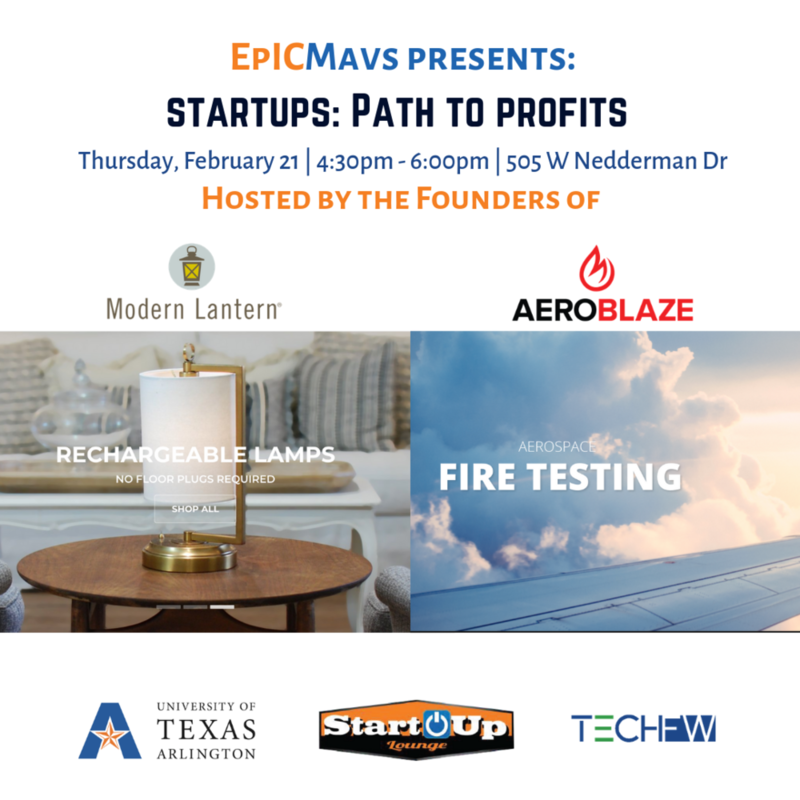 Join us THIS Thursday at the Startup Lounge at UTA as Carrie Fitzwater, co-founder of Modern Lantern and Andrew Feghali, founder of Aeroblaze, share their stories of starting their companies and the pathways they took to producing revenue. Modern Lantern offers products while Aeroblaze is in the service industry and both have found success with their business models. Come learn from both entrepreneurs and hear insights that can help your service or product-based company get on its way! Bring a friend and see you on Thursday! MassChallenge Texas, the not-for-profit, no equity, startup accelerator program will be hosting office hours and an info session during our next TechNest to tell you more about the world's most startup-friendly accelerator. During this info session, you'll hear more about the program's resources, community, and how you can compete for up to $500,000 in equity free cash prizes. All entrepreneurs and entrepreneur-curious are encouraged to join. Mix and mingle with the MassChallenge Texas team, get your questions answered, and engage with the community! Beverages will be served. Have specific questions and want some one-on-one time? Bring your questions and come learn how you can get involved and compete for a chance at up to $500,000 equity free cash prizes! With over 3 billion active social media users all over the world, social media marketing is no longer something you can afford to ignore as a business owner. But what do you post? And on which sites? Every platform has its own audience and every audience has its own expectation for what they want to see and how they want to see it. Come learn the ins and outs from Sandy El-Rayes, Marketing Director at TechFW. Sandy has over 10 years of experience in the marketing and sales industry. You don't have to be a graphic design artist or a content writing genius to build a strong social media presence. There are plenty of resources available that can help you get started. Sandy is going to share her tricks of the trade and give insight into the current social media landscape, which is constantly changing. Bring your questions and come prepared to learn how to create a customized content strategy for your business. See you then! RSVP HERE! Join us for TechNest as Hub International presents a topic on how to take the proper steps in protecting yourself from business risks. Forrest Broyles, an experienced Private Client Advisor for Hub International, has a wealth of knowledge in how to protect yourself as a business owner. He will be talking about the importance and role of a personal risk manager and the different threats business owners face that can impact and devastate their personal lives. The goal is for this to be as interactive as possible. Bring your real life experiences and situations and get your questions answered. Bring your questions and come find out what steps you need to take to make sure you're protected. Hub International is a leading full-service global insurance broker providing property and casualty, life and health, employee benefits, investment and risk management products and services. We will see you on Tuesday! Join us on Monday, February 4, for the first event in a regular series of events that Bios Partners and UNTHSC will host that will highlight and educate our community on the importance of entrepreneurship in Fort Worth. This event will feature the Founder and CEO of Encore Vision, Bill Burns, who will tell us his story about how he built his company that would sell to Novartis for $375M plus undisclosed milestone payments in 2016. Encore Vision developed a therapeutic treatment for presbyopia, the age-related loss of near distance vision that affects approximately 80% of people over the age of 45. Encore’s lead investigational product, EV06, addressed the cause of vision loss, where other available therapies only provided optical correction. Before starting Encore Vision, Mr. Burns had extensive career in the pharmaceutical industry. He spent 20 years at Alcon Laboratories in Fort Worth where he held a number of executive positions including as the VP of Worldwide Marketing for Pharmaceutical and Consumer Products. Prior to his tenure at Alcon, Mr. Burns worked at Bristol Myers Squibb and Norwich Eaton Laboratories. Fort Worth-based venture capital firm Bios Partners, who was an early funder of Encore Vision, will also be a part of the discussion. Les Kreis and Stella Robertson from Fort Worth-based venture capital firm will join the panel discussion and tell the story of how and why they decided to invest in Encore Vision. Please RSVP to join us for this free event and learn from one of Fort Worth’s most successful founders. Light appetizers, beer and wine will be served. You've heard the name all over Fort Worth. Seeing a need for a commercial kitchen incubator in Fort Worth, Cortney Gumbleton and Carlo Capua opened their doors to food entrepreneurs in June of 2018. By the end of the summer, they were at full capacity and starting to host events at their venue. They proceeded to win the FW Business Plan Competition and were named a finalist for FW's Small Business of the Year. This quick success didn't come easy though. Join us for TechNest as Cortney and Carlo share their story and the inspiration behind it. They'll share the good, the bad and the ugly, as well as how they set their model up to scale as quickly as they did. They'll also share insights into how their online marketing helped them evolve and build their brand. For anyone who has a business idea you want to act on or is looking to brand themselves better online to gain more business, these are the entrepreneurs you'll want to hear from. Grab a friend, bring your questions and we will see you there! Do you have an interest in entrepreneurship or working for a startup company? Join UTA Mavs and our community for our first FREE and interactive seminar series of the Spring semester! The University of Texas at Arlington #EpICMavs will be held in the lounge area on the 2nd floor of the MAC (Maverick Activities Center). Please let the front desk know that you are there for EpICMavs for free access. Email: startup@uta.edu for more information on the location, parking, or any other questions. Join us this coming Tuesday for TechNest and meet members of the Cowtown Angels to get a crash course on angel investing. Hear their perspectives on what they look for, dos and don’ts, and some key factors that go into their decision making. If you’re an entrepreneur looking to get in front of investors, don’t miss this opportunity to get all your questions answered by Angels themselves. TechNest is back in 2019! Join us as we explore creating an effective pitch deck for getting in front of investors with TechFW Executive Director and Cowtown Angels Director, Hayden Blackburn. Hayden has seen, mentored and coached entrepreneurs through 100s of pitch decks and 100s of investor pitches and he has tips to use whether it is your first presentation or your 50th. Our presentations should always be evolving and improving. He will be going over what makes the biggest difference in your deck, the core slides investors are looking for, the difference between a reading & presentation deck, and lastly, how to build comfort as a presenter. For anyone looking to raise capital for their venture or if you're just looking to better your public speaking skills and recruit team members to your vision, this is definitely a session you won’t want to miss! Thank you to HUB International for sponsoring this TechNest. TechFW Office will be closed for the holidays from Friday, December 21st to Wednesday, January 2nd. We will reopen on Thursday, January 3rd. Please email us if you need immediate assistance at hayden@techfortworth.org. Enjoy your holidays with family and friends and we look forward to another great year at TechFW!